Peering into the cosmos is a tricky business. Not all wavelengths of light pass easily through our rich atmosphere. But there are some natural windows that also happen to coincide with the light emitted by useful atomic and molecular tracers of cosmic properties. One of those tracers goes by the name of Diazenylium. It may sound like an exotic new material for a science fiction blockbuster to go in search of, or for superheroes to fear. In reality it's a simple little molecular ion, two parts nitrogen, one part hydrogen: N2H+. But diazenylium is a handy critter. It's long been a target of radio astronomy, both because its presence in interstellar gas helps reveal the degree of ionization of that gas (and hence much about the chemistry going on) and because it has a rotational transition (an abrupt change in quantum mechanical angular momentum) that can release a triplet of photons in a piece of the millimeter wavelength range where Earth's atmosphere is relatively transparent. 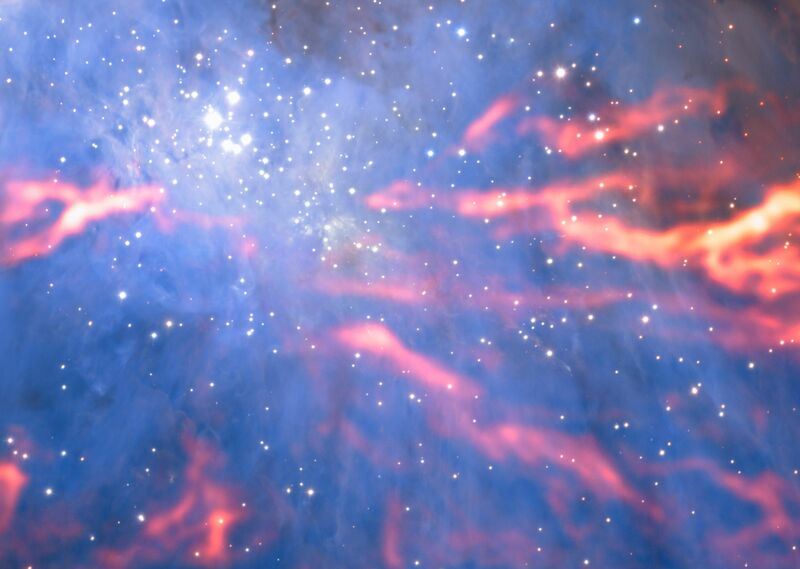 The Atacama Large Millimeter/submillimeter Array (ALMA) has used this property to construct a rather spectacular image of the thread-like structure of very cold gas in the Trapezium region of the Orion Nebula. Here's the image: red colors indicate concentrations of diazenylium, bluer colors are data from other telescopes of warmer gas glowing in infrared light. This image is a mosaic of individual datasets. ALMA's spatial resolution at millimeter wavelengths is so good that we can now begin to see the details of how this tracer of cold gas is structured. This in turn yields insights to the gravitational infall or contraction of material that will eventually form new stars, like the points of infrared light of young stellar objects already there in the Trapezium cluster. 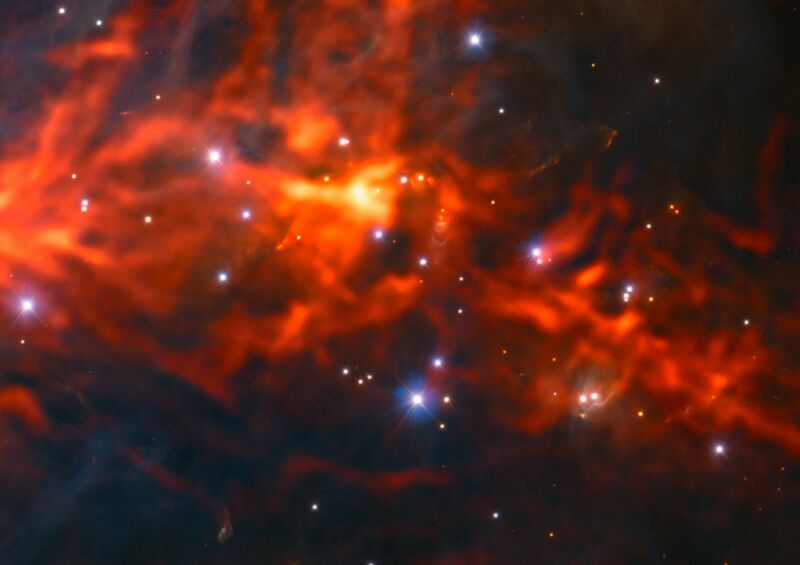 Here are a couple of closeups, views into the heart of stellar birth.